Mei (signature) : Mumei(Unsigned)attributed as Ishiguro Masaaki. Hakogaki:the design is flower and a bird. Ishigura Masaaki Saku Shakudo nanako plate gold and silver Iroe Zogan. 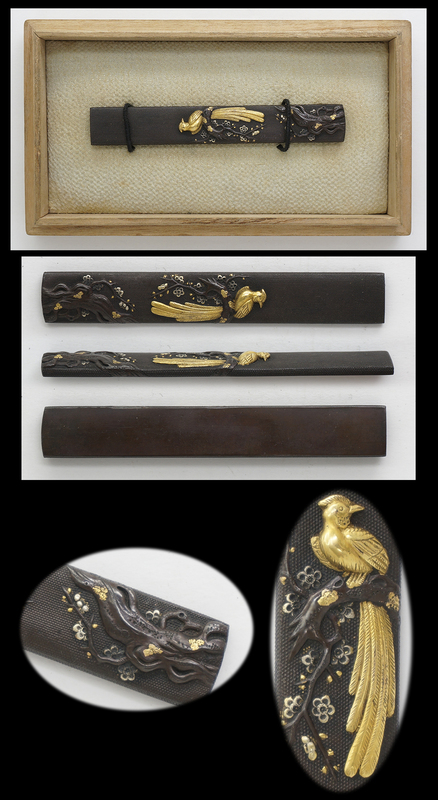 Ume tree and flowers and also long tail bird is engraved with gold color. The condition is very good and nice work. We guarantee NBTHK Hozon paper but we don’t e definitively Ishiguro Masaaki.